Today we had our first equestrian class - Charlie and Nathaniel were super excited but Will didn't want to do it because he felt scared. 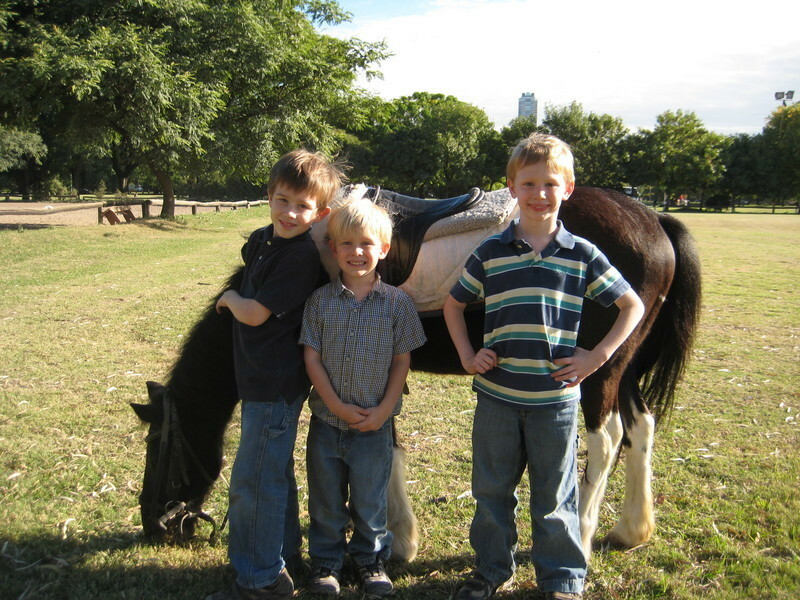 The last time we went to an estancia (ranch) Will didn't like it because the horse was so big he felt scared. But they started them off easy today on a very cute pony named Indio. The boys had a great time with their lesson and can't wait until next week. We are taking lessons at Club Aleman de Equitacion. We were suppose to have classes at Club Hipico (which is another equestrian club across the street from this one) but because they were setting up for a big event today all of their classes were moved to Club Aleman. So we ended up signing up for classes there instead. Hoy tuvimos nuestra primera clase de equitación - Charlie y Nathaniel estaban súper emocionada pero Will no quería hacerlo porque sentía miedo. La última vez que fuimos a una estancia (ranch en inglés) a Will no le gustó porque el caballo era muy grande y él sintió miedo. Pero ellos comenzaron hoy muy fácilmente sobre un pony muy lindo llamado Indio. Los chicos la pasaron muy bien durante su lección y no pueden esperar hasta la próxima semana. Íbamos a tomar clases en el Club Hípico, sin embargo hoy la clase fue en el Club Alemán (que es otro club de equitación en la misma calle que este), porque estaban preparándose para un gran evento y todas sus clases se trasladaron al Club Alemán. Así que finalmente nos inscribimos en este lugar en vez. Yesterday I decided to give the boys a break because we did alot of schoolwork the first of the week and we all felt tired of studying. So today was a free day. They played with legos and marble blocks all morning and then we went to the park in the afternoon. The only scheduled activity on Thursday is their piano lesson so we went to that and then came back to the park again. It felt great to get out of the house and just spend time outside. 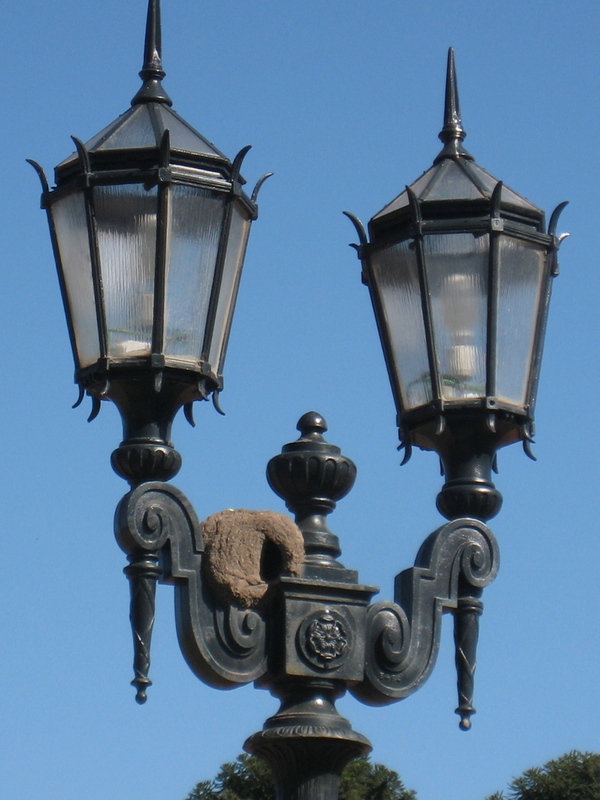 Though I really love living in Buenos Aires city life wears on me sometimes. I miss the mountains and lakes of Seattle as well as having a yard for the boys to run around in. But we are very lucky to live in Palermo because our apartment is surrounded by great parks and plazas. 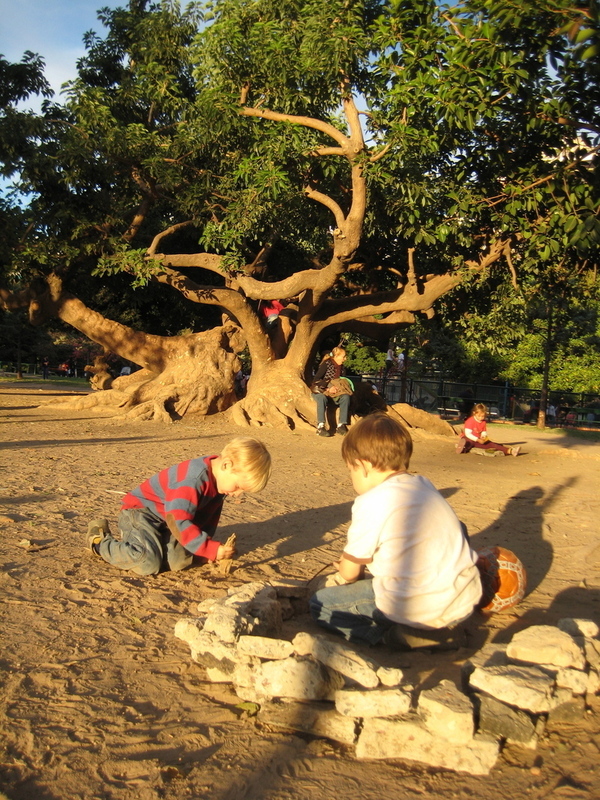 Today we decided to go to Parque Las Heras because it is closer to our house and to our piano lesson. Ayer decidí darles un descanso a los muchachos porque hicimos un montón de trabajo escolar el primer día de la semana y todos estábamos cansados de estudiar. Así que hoy fue un día libre. Jugaron con legos y bloques toda la mañana y luego nos fuimos al parque por la tarde. La única actividad para el jueves es su clase de piano, así que fuimos a eso y luego regresamos al parque de nuevo. Fue muy bueno salir de la casa y, simplemente, pasar tiempo al aire libre. Aunque realmente me encanta vivir en la ciudad de Buenos Aires, me cansa a veces. Echo de menos las montañas y lagos de Seattle, así como tener un jardín para que los chicos corran. Pero somos muy afortunados de vivir en Palermo, porque nuestro apartamento está rodeado de grandes parques y plazas. Hoy hemos decidido ir al Parque Las Heras, ya que está más cerca de nuestra casa y nuestra clase de piano. Today I want to write a summary of our morning schedule. I have found that many people ask me about our schedule when they are trying to understand homeschooling and what the day looks like. Our day starts a little later than a normal school day (which is one of the benefits!) but usually we eat breakfast together at 8:30. We start school at 9:30 and begin with our workbook time. Charlie and Will do their workbooks independently which gives me time to work with my youngest Nathaniel. The big boys just ask me for help when they get stuck on something they don't understand. They are both working through a Harcourt Press Complete Curriculum and they do 1-2 pages in each section which includes all of the basics (spelling, grammar, math, comprehension, writing, and test prep). This is definitely the least inspiring part of our day but it gives the boys a chance to practice independence and self discipline. We talked for a long time today about the importance of personal responsibility and how much self discipline is important in life. It is amazing how much it helps to give them vision for their future and connect it to what we are doing each day. I need it as well to keep our focus and realize that there is purpose to what we are doing that is larger than just learning the plural possessive pronouns. After workbook time they all get recess for 20-30 minutes. Then after recess Charlie and Will start on their reading lists. The boys have their own respective lists and after their reading they either narrate to me orally or write it in their narration books. They really want to get done before 12:00 so they can watch their favorite program "Paka Paka". They watch this program while I prepare lunch which marks the end of our morning routine. Hoy quiero escribir un resumen de nuestro horario de la mañana. He encontrado que mucha gente me pregunta acerca de nuestro horario cuando están tratando de entender la educación en el hogar y cómo es el día. Nuestro día comienza un poco más tarde que un día escolar normal (lo que es uno de los beneficios!) Pero por lo general desayunamos juntos a las 8:30. Empezamos con la escuela a las 9:30 y comenzamos con nuestro workbook. Charlie y Will hacen sus workbooks independientemente lo que me da tiempo para trabajar con mi hijo menor, Nathaniel. Los chicos grandes sólo me piden ayuda cuando se encuentran con algo que no entienden. Ambos están trabajando con un workbook de Harcourt Press y hacen 1-2 páginas en cada sección que incluye todos los elementos básicos (ortografía, gramática, matemáticas, comprensión, escritura y preparación de la prueba). Esto es, sin duda la parte menos inspiradora de nuestros días, pero da a los muchachos la oportunidad de practicar la independencia y la autodisciplina. Hablamos durante mucho tiempo hoy acerca de la importancia de la responsabilidad personal y como la auto disciplina es importante en la vida. Es increíble como este tipo de conversación ayuda a darles una visión para su futuro y conectarlo a lo que estamos haciendo todos los días. Lo necesito para mantener nuestro foco y darnos cuenta de que hay un propósito para lo que estamos haciendo, mayor que simplemente aprender los pronombres posesivos en plural. Después del workbook ellos tienen un recreo durante 20-30 minutos. A continuación, después del recreo Charlie y Will comienzan con las listas de sus lecturas. Los chicos tienen sus respectivas listas y después de leer sus libros ellos me lo narran oralmente o lo escriben en su libro de narración. Realmente quieren terminar todo antes de las 12 para poder ver un programa en el canal “Paka Paka”. Ellos miran este programa mientras preparo el almuerzo, lo que marca el final de nuestra rutina de la mañana. My kids attend a wonderful chess program called Caballito de Palermo. This weekend their teacher (who is also a friend) was very sweet and came to our apartment to give them a makeup class. We had friends in town so their kids were able to join us also. The kids had a great time together and it was fun to watch them playing. I really appreciate this program because the teachers not only want to teach the kids how to play chess well but also the importance of learning from your mistakes and being a good sport. They have tournaments every few months and it has been very good for our kids to participate. I really hope for our boys that they can learn to see their failures as opportunities instead of being defeated by them. I am someone who really struggles with perfectionism and I hope my boys can learn to have more freedom in their life than what I have allowed myself. Mis hijos van a un programa de ajedrez maravilloso que se llama Caballito de Palermo. Este fin de semana su maestra (que también es mi amiga) fue muy dulce y vino a nuestro apartamento para darles una clase de recuperación. Teníamos amigos de Estados Unidos aquí y sus hijos se unieron a nosotros también. Los niños la pasaron muy bien juntos y fue muy divertido verlos jugar. Realmente aprecio este programa porque no sólo los maestros quieren enseñar a los niños como jugar bien al ajedrez, sino también la importancia de aprender de sus errores y tomarlo bien cuando se pierde el partido. Tienen torneos cada pocos meses y ha sido muy bueno para nuestros niños participar en ellos. Realmente espero que nuestros chicos puedan aprender a ver sus fracasos como oportunidades en lugar de ser derrotados por ellos. Soy una persona que verdaderamente lucha por el perfeccionismo y espero que mis hijos puedan aprender a tener más libertad en su vida que lo que me he permitido. Many people here ask me what kind of curriculum I use and how I choose what to teach. The reality is that now there are so many people homeschooling in the United States (over 1.7 million) that there are too many resources. It can be overwhelming to sort through them all. In the next few posts I will write about each of the different resources we use and why we like it. For our literature we follow a free online curriculum called Ambleside Online based on the educational philosophy of Charlotte Mason. Our educational approach, though quite eclectic, can most be described as a combination of Charlotte Mason and Classical Education. Although I have found we have days that could be considered unschooling. I am very driven regarding their education but I am working hard to be aware of when they need space and give them time to be creative and discover their own interests. It is a difficult balance to try and maintain but most days it goes quite well. Here is the link to our base curriculum: http://www.amblesideonline.org/. I haven't found an equivalent to this in spanish but I haven't looked very hard. My guess is that there is something similiar out there since homeschooling has grown quite popular in Spain. We have used this curriculum for 3 years now and I like how academically rigorous it is as well as the choice of books. It has a very British focus so we substitute some of the books to give it more of a US (and also now Argentine) focus. 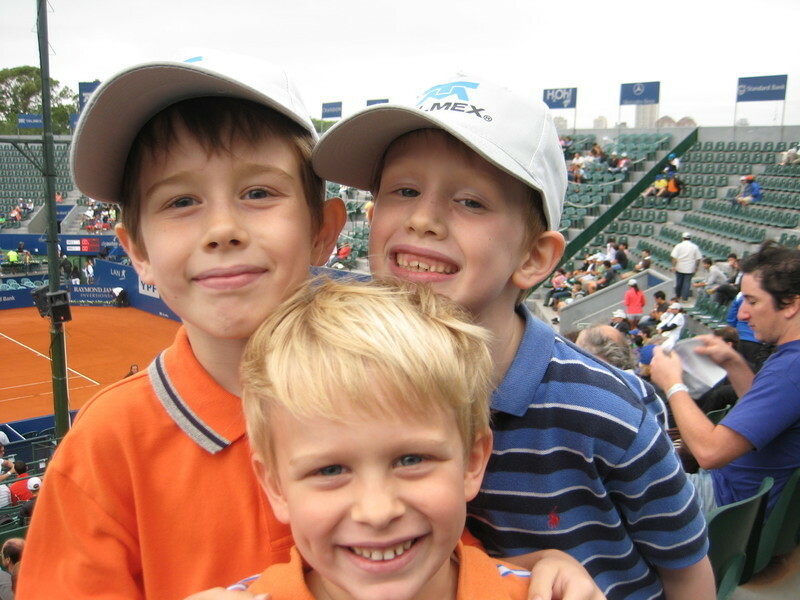 This is a picture of the boys at the Copa Telmex tournament here in Buenos Aires a few months ago. / Esta es una foto de los chicos en la Copa Telmex, un torneo aquí en Buenos Aires hace unos meses. One thing I love about homeschooling is the flexibility that it allows. One day last week the weather was just too perfect to stay indoors so we loaded up all of our books and headed to Plaza Alemania (a park near our house). 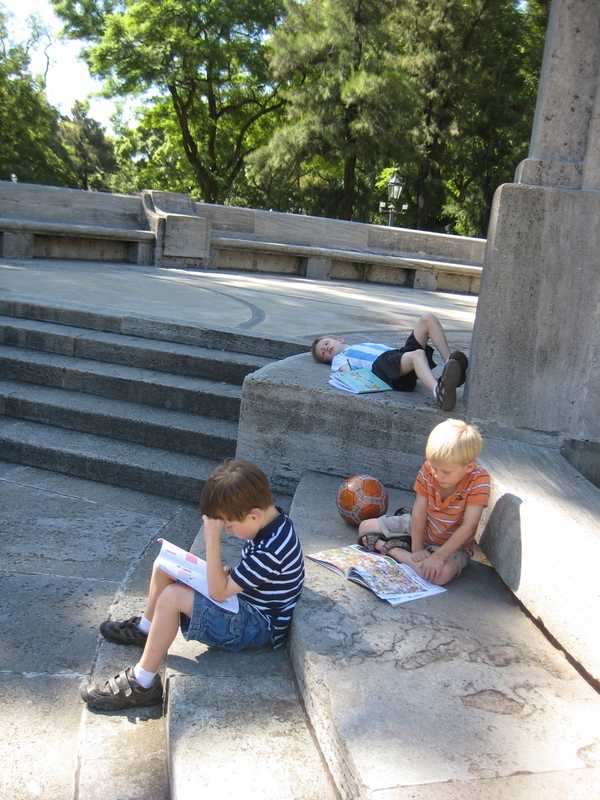 One of the pictures is of the boys doing their math workbooks at the park. (This is a typical picture of my middle child with homeschool- he is often staring at the clouds instead of doing his math!) The other picture is from "kindergarten day". One day a week Nathaniel (my youngest who is four years old) gets to pick what we do for school that day. Truth be told it is also Charlie and Will's favorite school day. Our kindergarten day this week was a trip to the zoo - a short 15 minute walk from our house. Una de las cosas que amo de escuela en casa es la flexibilidad que permite. Un día, la semana pasada el clima era perfecto y necesitaba salir para disfrutarlo, así que cargamos todos nuestros libros y nos fuimos a la Plaza Alemania (un parque cerca de nuestra casa). Una de las imágenes es de los chicos haciendo sus libros de matemáticas en el parque. Nuestro día de jardín de esta semana fue un viaje al zoológico - un corto paseo a 15 minutos de nuestra casa. One thing I wrote about in an earlier post was that schools don't teach kids how to think for themselves. I wanted to share an excerpt from an author that those involved in education and in homeschooling are very familiar with (though he is very new to me). I feel like he articulates so well much of my own personal history with public school and only cements more my own philosophy regarding education and institutions of any sort. It is not that I didn't have some great teachers during my education (though honestly I could count them on one hand). The glaring fact is that my public school experience reflected quite strongly the things that this man articulates. The thing that makes me deeply sad about this fact is that as my boys grow up their differences in personality are so obvious and glaring. That is something to be protected - not squashed under some institution. My brother came to visit recently and remarked about how he couldn't believe how different our boys are from one another. This is something I desperately want to protect and encourage. I want them to be proud of their differences and marvel at the diversity that exists in human life. 1. The children I teach are indifferent to the adult world. This defies the experience of thousands of years. A close study of what big people were up to was always the most exciting occupation of youth, but nobody wants to grow up these days and who can blame them? Toys are us. 2. The children I teach have almost no curiosity and what they do have is transitory; they cannot concentrate for very long, even on things they choose to do. Can you see a connection between the bells ringing again and again to change classes and this phenomenon of evanescent attention? 3. The children I teach have a poor sense of the future, of how tomorrow is inextricably linked to today. As I said before, they have a continuous present, the exact moment they are at is the boundary of their consciousness. 4. The children I teach are ahistorical, they have no sense of how past has predestined their own present, limiting their choices, shaping their values and lives. 5. The children I teach are cruel to each other, they lack compassion for misfortune, they laugh at weakness, and they have contempt for people whose need for help shows too plainly. 6. The children I teach are uneasy with intimacy or candor. My guess is that they are like many adopted people I've known in this respect - they cannot deal with genuine intimacy because of a lifelong habit of preserving a secret inner self inside a larger outer personality made up of artificial bits and pieces of behavior borrowed from television or acquired to manipulate teachers. Because they are not who they represent themselves to be the disguise wears thin in the presence of intimacy so intimate relationships have to be avoided. 7. The children I teach are materialistic, following the lead of schoolteachers who materialistically "grade" everything - and television mentors who offer everything in the world for free. 8. The children I teach are dependent, passive, and timid in the presence of new challenges. This is frequently masked by surface bravado, or by anger or aggressiveness but underneath is a vacuum without fortitude. Una de las cosas que escribí en un post anterior fue que las escuelas no enseñan a los niños a pensar por sí mismos. Quería compartir un extracto de un autor con el que los involucrados en la educación y en la educación en el hogar están muy familiarizados (aunque es muy nuevo para mí). Me siento como que en él se articula muy bien gran parte de mi propia historia personal con la escuela pública y sólo confirma más mi propia filosofía respecto a la educación y las instituciones de cualquier tipo. No es que yo no haya tenido algunos grandes maestros durante mi educación (aunque honestamente yo podría contarlos con una mano). El hecho evidente es que mi experiencia con las escuelas públicas se refleja con mucha fuerza en las cosas que este hombre articula. Lo que me pone muy triste de este hecho es que a medida que mis hijos crezcan sus diferencias de personalidad serán tan evidentes y manifiestas. Eso es algo que debe ser protegido - no aplastado bajo alguna institución. Mi hermano vino a visitarnos recientemente y dijo que él no podía creer lo diferentes que nuestros niños eran entre sí. Esto es algo que quiero desesperadamente proteger y fomentar. Quiero que estén orgullosos de sus diferencias y se maravillen con la diversidad que existe en la vida humana. 1. Los niños que enseño son indiferentes al mundo adulto. Esto contradice la experiencia de miles de años. Desde siempre, estudiar detenidamente el mundo adulto fue la ocupación más emocionante para la juventud, pero nadie quiere crecer en estos días y quién puede culparlos? Los juguetes somos nosotros. 2. Los niños a los que enseño casi no tienen curiosidad y la que tienen es transitoria, no pueden concentrarse durante mucho tiempo, incluso en las cosas que quieren hacer. ¿Podés ver una conexión entre el sonido de la campana una y otra vez para cambiar de clase y este fenómeno de atención evanescente? 3. Los niños a los que enseño tienen una pobre sensación de futuro, de cómo el mañana está inextricablemente ligada a la actualidad. Como he dicho antes, tienen un presente continuo, el momento exacto en que se encuentran es el límite de su conciencia. 4. Los niños que enseño son ahistóricos, no tienen idea de cómo el pasado ha predestinado su propio presente, limitando sus opciones, la configuración de sus valores y sus vidas. 5. Los niños que enseño son crueles entre sí, carecen de compasión por la desgracia, se ríen de la debilidad, y tienen desprecio por las personas cuya necesidad de ayuda se muestra muy claramente. 6. Los niños a los que enseño se sienten incómodos con la intimidad o la franqueza. Mi conjetura es que son como muchas personas adoptadas que he conocido en este sentido - no pueden hacer frente a la intimidad verdadera a causa del hábito constante de preservar un yo interior secreto dentro de una personalidad exterior más grande compuesta por trozos artificiales y piezas de comportamiento tomados de la televisión o adquiridos para manipular a los maestros. Debido a que no son lo que representan para sí mismos, el disfraz se gasta en presencia de la intimidad, por lo que las relaciones cercanas tienen que ser evitadas. 7. Los chicos a los que enseño son materialistas, siguiendo el ejemplo de los maestros de escuela que materialísticamente “gradúan” todo - y las figuras televisivas que ofrecen todo en el mundo gratis. 8. Los chicos a los que enseño son dependientes, pasivos y tímidos ante la presencia de nuevos desafíos. Esto es frecuentemente enmascarado por jactancia superficial o por ira o agresividad pero por debajo hay un vacío sin fortaleza. It is funny to me now that I was so nervous to start a blog because now that I have started I think of things all day that I want to add! I am realizing that it is easy because I am blogging about something that I feel passionate about and feel excited to share with those that want to know more. It is great to have a place to do it because life is so busy and it hard to share quickly over a coffee or a playdate. And I can do this while my kids are doing their math workbooks! :) So now when I meet people that are interested in homeschooling and how it works I can just send them here. So for today I want to just add an amazing resource that my husband found and we have been using to help teach the kids math/science. It is called Kahn Academy and it is totally free. http://www.khanacademy.org/ I feel incredibly grateful that this man had a vision and a desire to do this. Also, I have to add that today homeschool was ended early because of the "superclassico" which is the soccer game between Boca and River. For those that aren't from here (and for my family that is in the South) -it is the equivalent of the Auburn/Alabama game here in Argentina. But even more intense (if you can believe it) than Auburn and Alabama! Es graciosa para mí ahora que yo estuviera tan nerviosa por comenzar un blog porque ahora que he empezado yo tengo muchas cosas todo el día que deseo agregar! Me di cuenta de que es fácil porque este blog es algo que me apasiona y me siento muy contenta de compartir experiencias con aquellos que quieren saber más. Es bueno tener un lugar para hacerlo porque la vida es muy ocupada y es difícil compartir rápidamente en un café o en una cita para jugar. Puedo hacer esto mientras mis hijos están haciendo sus libros de matemáticas! :) Así que ahora cuando me encuentro con personas que están interesadas en escuela en casa y cómo funciona los puedo mandar aquí. Así que para hoy sólo quiero añadir un recurso increíble que mi marido encontró y que hemos estado utilizando para ayudarnos a enseñar a los niños de matemáticas y ciencias. Se llama Kahn Academia y es totalmente gratuito. http://www.khanacademy.org/ Me siento muy agradecido de que este hombre haya tenido una visión y un deseo de hacer esto. También, tengo que agregar que hoy la escuela terminó temprano debido a un “superclásico” que es un partido de fútbol entre Boca y River. Para los que no son de acá (y para mi familia que está en el Sur) esto es el equivalente al partido entre Auburn/ Alabama acá en Argentina. Aún más intenso (si lo pueden creer) que Auburn y Alabama! Today I wanted to put a quote from the Eton College website which articulates well part of the reason we homeschool and what I hope to achieve with their education. One of the main reasons I do not send our boys to school is that most public and private schools don't even come close to achieving the goal of creating independent thinkers. Later I will post some videos and transcripts that argue that most mainstream education creates exactly the opposite. Kids that are unable to think for themselves. "Our primary aim is to encourage each Etonian to be a self-confident, inquiring, tolerant, positive young man, a well-rounded character with an independent mind, an individual who respects the differences of others. By the time he leaves the school, we want each boy to have that true sense of self-worth which will enable him to stand up for himself and for a purpose greater than himself, and, in doing so, to be of value to society." Hoy quería poner una cita de la página web de Eton College que expresa una parte de la razón por la que hacemos escuela en casa y lo que espero lograr con su educación. Una de las principales razones de no enviar a nuestros niños a la escuela es que la mayoría de escuelas públicas y privadas no están ni siquiera cerca de lograr el objetivo de crear pensadores independientes. Más tarde voy a publicar algunos videos y transcripciones que sostienen que la educación mayoritaria crea exactamente lo contrario: niños que son incapaces de pensar por sí mismos. "Nuestro principal objetivo es animar a cada Etoniano a ser seguro de sí mismo, inquisitivo, tolerante, un joven positivo, una personalidad bien redondeada con una mente independiente, una persona que respeta las diferencias de los demás. En el momento en que abandone la escuela, queremos que cada niño tenga ese verdadero sentido de la autoestima que le permita ponerse de pie por sí mismo y para un propósito mayor que él, y, al hacerlo, ser de valor para la sociedad ." I am not sure how to start this blog without giving a superlong introduction so I am just going to jump in and do it without all of the explanation! We have accomplished our first two weeks of homeschooling and I feel very good about our decision to do it this year. It was an agonizing decision for a number of reasons not the least of which is the fact that homeschooling is virtually unheard of here in Argentina. So I was worried about it being too isolating and lonely. 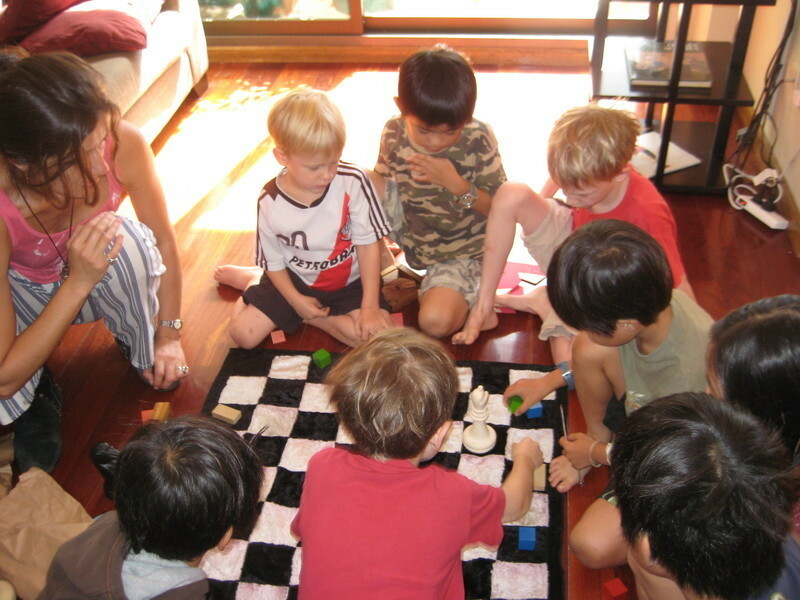 But with our afternoon activities (chess, piano, playdates, etc.) and Saturdays at Club de Amigos (where the boys do swimming/soccer/tennis) we are able to keep up with many of the friends we made last year and continue to feel a part of life here. Highlights of these first two weeks: Practicing our mandarin chinese with our househelp Gladys because she is fascinated with the characters and the sounds, drawing at Parque Tres de Febrero, the boys yelling "Mommy!! Quick! Come look- it is the Cape of Good Hope!!" while watching PakaPaka (a great educational program shown here) and watching Will dance with his friend at a birthday party. 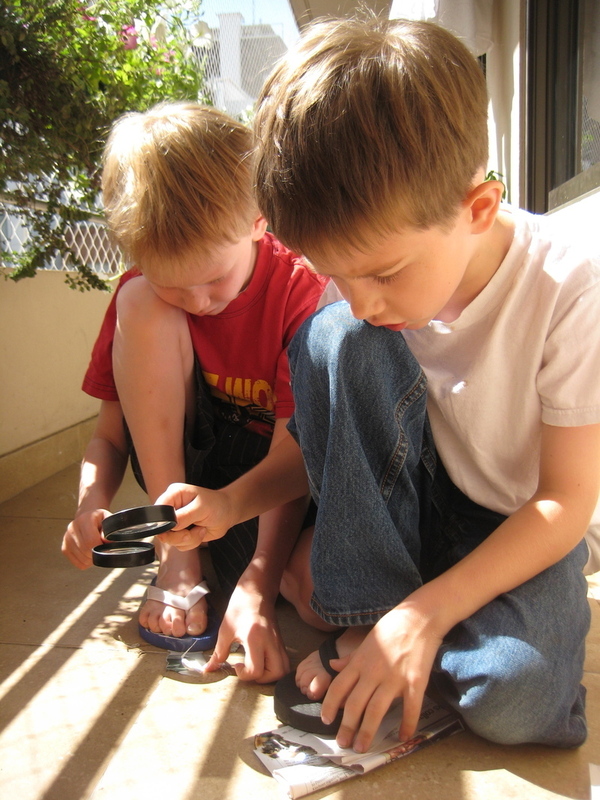 Also, the picture included is the boys learning how to start a fire with a magnifying glass which was their highlight of the first two weeks! No estoy segura de cómo comenzar este blog sin necesidad de dar una introducción superlarga. Así que sólo voy a empezar sin ninguna explicación en absoluto! Hemos cumplido nuestras dos primeras semanas de educación en el hogar y me siento muy bien acerca de nuestra decisión de hacerlo este año. Fue una decisión dolorosa por una serie de razones, incluído el hecho de que escuela en casa es prácticamente desconocida en la Argentina. Así que me preocupa demasiado el aislamiento y la soledad. Pero con nuestras actividades por la tarde (piano, ajedrez, etc) y los sábados en el Club de Amigos (donde los niños hacen natación / fútbol / tenis) somos capaces de seguir el ritmo de muchos de los amigos que se hicieron el año pasado y continuar siendo parte de la vida aquí. Aspectos destacados de estas primeras dos semanas: La práctica de nuestro chino mandarín con nuestra empleada Gladys porque ella está fascinada con este idioma, dibujar en el Parque Tres de Febrero, los niños gritando "¡Mamá! ¡Rápido! Mirá!-es el Cabo de Buena Esperanza! " mientras ellos están viendo PakaPaka (un programa educacional muy bueno aquí) y verlos a bailar con sus amigos en una fiesta de cumpleaños. Además, en la foto se ve a los niños aprendiendo a encender un fuego con una lupa, que fue lo más destacado pra ellos en estas primeras dos semanas!